Click on File > Publish to the Web. Under the "Web Page" dropdown, select "Microsoft Excel (.xlsx)". Keep "Entire Document" selected in the preceding dropdown. Note for advanced users: in our tests, the "Automatically republish when changes are made" checkbox doesn't always work well. 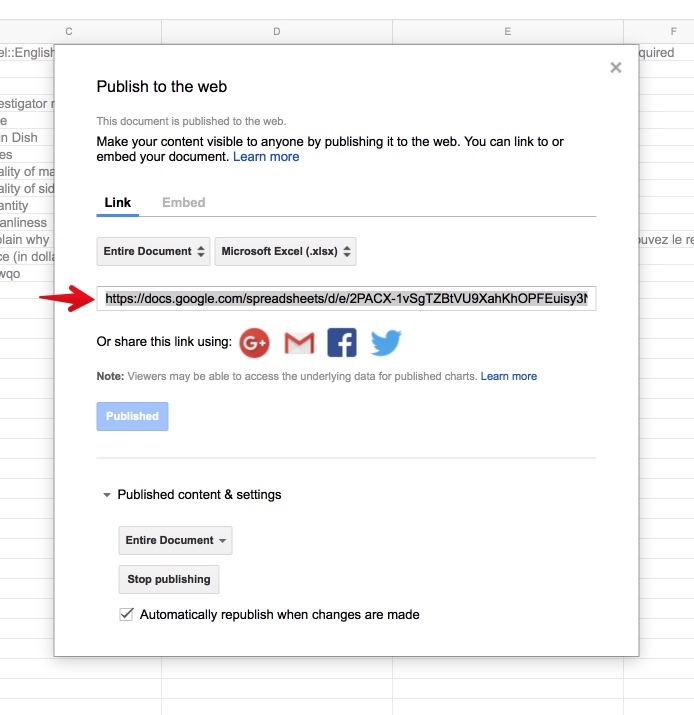 You may need to stop publishing and republish the spreadsheet to get an updated link. Make sure the XLSForm file is in a public Dropbox folder in your account. Copy its link. It should end with the suffix ?dl=0. Replace the 0 with 1, so that your link ends in ?dl=1.